So, What Torpedoed The Genuine Vital Groups? ''In the church meetings we may live Christ, but do we live Christ in our bedrooms or dining rooms and with our wives, husbands, and children? ...Many saints are very good in the church meetings and in the church service, but at home they may live the life not of a God-man but of a ''scorpion-man,'' exchanging words or quarreling. A certain couple may love the Lord and His recovery. However, at dinner the husband may criticize his wife for her attitude, and she may condemn him for his way of speaking. Then after dinner they attend the meeting of their vital group. But how can these two ''scorpions'' be vital?" Because many LSM/LC leaders have ignored God's prerequisite to first "learn how to live Christ at HOME", (Gal 2:20) this has led saints right into the satanic trap of "Corporate Meeting Performance". It eventually became ok and "normal" to live like the devil at home, and then, switch gears and "perform" like a "holy angel" when in the corporate meetings. To the approval of everyone except God? Dear ones this is NOT the Normal Christian Life! This is none other than DOMESTIC VIOLENCE in all it's forms and variations [emotional, mental, sexual, spiritual, etc]! And history tells us that such a family atmosphere produces children which are very susceptible to the pull of drugs and the world. Seen that problem lately? So, Pretending to "Live Christ in the Meetings" is probably what Torpedoed The Genuine Vital Groups. Agree? Wanna see how the LSM Editors "softened" Witness Lee's spoken words in their print version of Message Eleven? 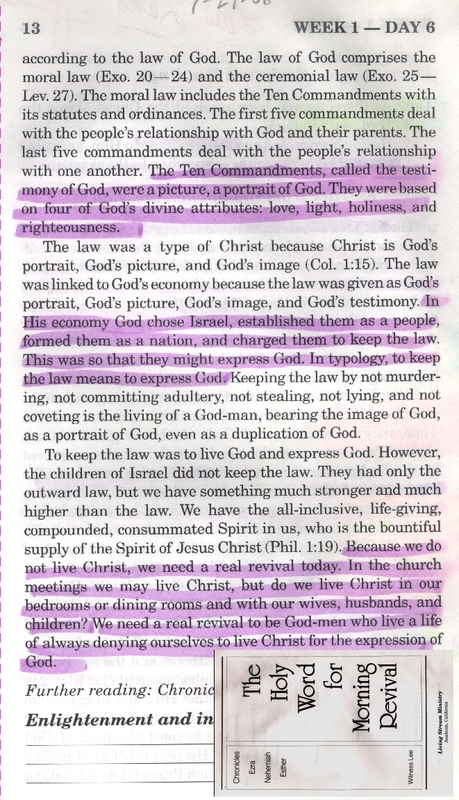 "...We also need to have a God-man living in the church life, especially in relation to what we call the vital groups. How can we have a vital group if we ourselves are not vital? This is impossible. Suppose at dinner a brother and his wife are not happy with each other. They even exchange words and argue for quite a long time. Suddenly they remember that later that evening they must attend a meeting of their vital group. But how could this couple be vital in the meeting? Because they are not vital at home in their married life, they have no way to be vital in the meeting." but WL's term "Bedrooms" was tossed out as well? It's makes me sad to think how the Bedroom is probably THE spot in our homes where the most deeply damaging forms of Domestic Violence have been inflicted. And by those who claim to be Christians no less! So what would those of you that were around long enough to witness the sinking of the promising "VITAL GROUPS" ship have to say? 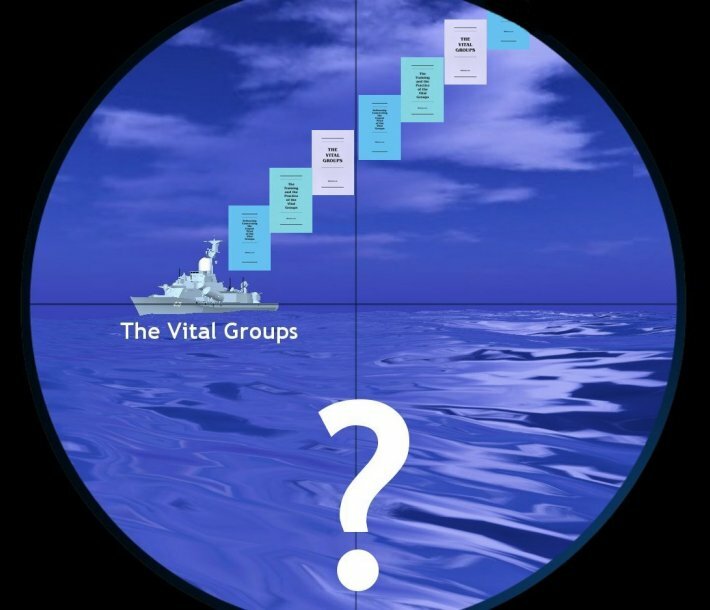 Re: So, What Torpedoed The Genuine Vital Groups? ...LEE is responsible for the deadness and lack of vitality ! When did HE include his wife in the meetings in a cherished, loving way ? She was his slave imho. He spoke of the 'God-man' when he had absolutely NO CLUE and worst yet NO business talking about something he did not live by. In most church services I've attended these past few years, the wives of the pastors not only sit by their husbands but actively participate in sharing the Word of God with the assembly, not only in 'sisters meetings'. How we all fell under the Lee spell is extremely sad. As I've studied voraciously the Word of God, with prayer and under the LIGHT of the Holy Spirit, Lee had soo many wrong teachings ! BUT what he got correct was VERY, VERY Correct. However, I think his correct teachings came in the early 70s. By the end of the 70s' his teachings had no Anointing. You can see it by the FRUIT in his flock. No Life..No Love.. He took the pure Bible away from the saints. He turned them into lazy sheep. Read the life studies, the HWMR, go to meetings, conferences, trainings...call on the Lord..dress alike, walk alike, talk alike and you'll 'make it through the pearly gates'. You don't need to read the Bible, unless it's the RcV with all Lee's FOOTNOTES and HIS OPINIONS. Hmmm... Isn't that what happened in the Dark ages? The RCC 'read' the bible to the illiterates? How many Catholics read the Bible today...unless it's the Catholic Bible. But the missles and the mass take care of the flock in general...and a glimpse of the Pope when he comes to town. I don't know what Lee taught in the 50s and 60s. All I know from what I've read is he made some bad business wheeling and dealing in Taiwan and came to the U.S. wheeling and dealing in Washington state...possibly Seattle or Spokane. I don't know how his ministry got started here. What Christian leaders invited him to speak. They had to be Chinese leaders because his English was so horrific even in the 70s when I was there. Who could understand him? I am not judging/criticizing his broken english...just making an observation. Thank GOD, NO MAN can pluck us out of the Father's Hand ! Simple answer? God did it. God "torpedoed" Witness Lee's "vital groups". Perhaps WL's bright ideas weren't vital to God. You always have to be sure your premise is correct. In this case, that these "groups" are 1) of God; 2) genuine; and 3) vital. If the answer is yes, then it can't be "torpedoed." If it gets "torpedoed" then your premise is wrong, i.e., it's man-made or Lee-made. Nell, sorry but I don't buy your logic. If that were true then the early church vitality which sprang directly from the hand of God would not have diminished. It's a fallen world and people like you and me have completely free will to chose whether or not to obey God. ...I think the chairs, especially toward the back, are full of the "checked-out." MikeH - In the 3min segment of a 2006 Conference message below, Ron Kangas sheds light on why there are so many "checked out" ones sitting in the back of LSM/LC meetings. He also explains what might be behind the bizzare behaviors we have observed in many who prefer the front row? (1) Ron Kangas has a consistent habit of running away from whatever he considers to be a transmitter of death. I can't help but wonder who Ron's favorite Bible hero might be. Could it be Jonah? (2) In Ron's mind it's somehow less important that we speak well of and be in fellowship with church "members" than it is for us to speak well of and be in fellowship with church "leaders". Where is that in the Bible? But then Ron gets deeper into trouble by warning us of something which he himself has become very guilty of doing - That it's dangerous for anyone to speak evil of another member of the Body of Christ (again, especially a leader) and then simply go on "enjoying" the Lord? (3) Ron tells a Whopper regarding the standing and practice of LSM/LC leadership: "We will simply not accept, we will not condone any factor of division." His story (about the husband who told his wife to go to hell) reveals how LSM/LC leaders' typically have a track record of doing just the opposite - they often tolerate horrendous levels of disharmony and division in the saints homes as long as those members will still attend and support Local Church meetings. Ron in essence is saying "those in division at home may attend LC meetings as long they arrive late, sit on the back row, have their head down, and be silent". This "ascetic" brand of false teaching not only flies in the face of our Lord Jesus' word in Matt 5:24 to "go home first, be reconciled, then bring your offering", but this speaking also contradicts Witness Lee's very clear instruction in the Vital Groups messages [see beginning of this thread], Life Study of Chronicles & the Life Study of Phillipians. Based upon the fact he was caught reviling Steve Isitt [publicly labeled Steve a man of death ], and continues to avoid dealing with that sin, I am thinking Ron Kangas should at least follow his own faulty advice: Which is, come to meetings late, sit on the back row, have your head down, and remain silent. Although it's considerably "leavened", this "lite" version of humility he's prescribing for LC brothers who curse their wives might be a tiny step in the right direction for brother Ron - if he could embrace it. PriestlyScribe, is it possible the "checked-out ones" are given to the ground of locality doctrine. They will not consider meeting anywhere else. It is possible they see re-speaking brother Lee's ministry as performing. It's a charade. In the words of the late Art Katz, games grown men play. So yes, these ones sitting in the back have checked out; checked out from playing the game. Maybe they've checked out because all they hear is clanging cymbals.